It’s official –Deepika Padukone and Ranveer Singh were married a lavish wedding ceremony in Lake Como, Italy. Although pictures from the occasion are scarce, the famously private couple have given us a glimpse into the celebrations by sharing images on Instagram –and of course, they’re gorgeous! The wedding is believed to have taken place at the 18th-century Villa del Balbianello, which overlooks the idyllic setting of Lake Como. It was a two-day celebration that began with a Konkani ceremony, followed by Sindhi ceremonyBollywood stars confirmed their engagement back in January, and are believed to have to been together for six years. The Konkani consisted of a white colour scheme, with the bride dressed in shades of gold, orange and red. 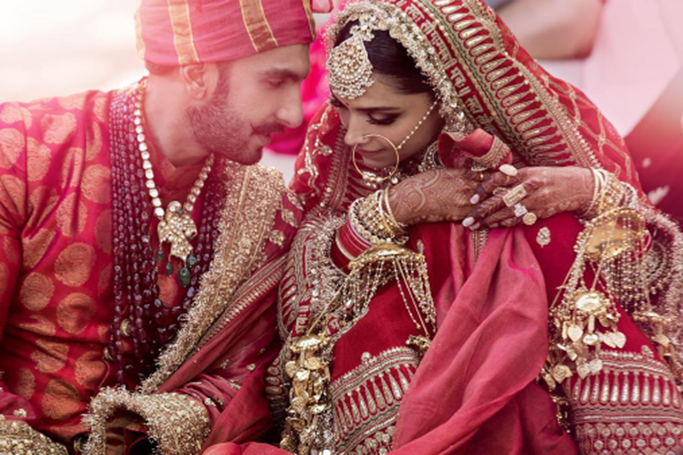 The next day the couple decided on traditional crimson and gold wedding attire, as Deepika Padukone and Ranveer Singh both wore designs from Sabyasachi Mukherjee.